There’s a reason so many bands namecheck it as their favourite venue. 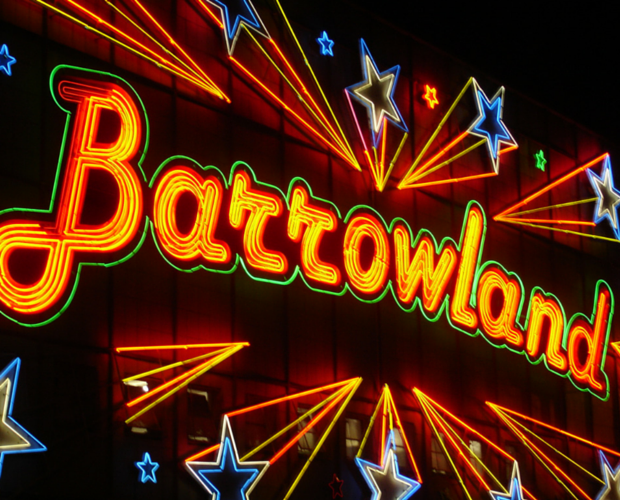 With its bouncy sprung floor and stars-and-diamonds ceiling, its gaudy neon sign and booze-and-burgers smell, Barrowland guarantees a magical experience. Let’s be honest. It’s not the kind of place you’re going to see Cliff Richard and clap politely while wearing your best clothes. From the moment bands strum their first note, the audience bounces, lager flies– and both those on stage and in the audience have the time of their lives. It’s the favourite venue of Oasis and U2. One band is on YouTube encouraging a crowd at London’s O2 to: “Come on! Act like it’s the Barrowland!” Maybe that unique atmosphere is a hangover from Barrowland’s days as a dancehall. Originally built as a venue for stallholders at the Barras market to party, it soon became the place to go to dance, drink and hopefully “winch”. You were guaranteed a great night. That magical atmosphere hasn’t been lost with its 1980s transformation into a music venue. As the lights go down, there’s the briefest hush before the band comes on. Then that sprung floor– which supposedly has tennis balls underneath it – takes a pounding as the audience moves as one, bouncing along, roaring approval, lager soaking everyone. Lesser venues would pay hard cash to get half of Barrowland’s atmosphere. All the money in the world couldn’t buy it.